By default, idibu uses the posting date as the job's start date. 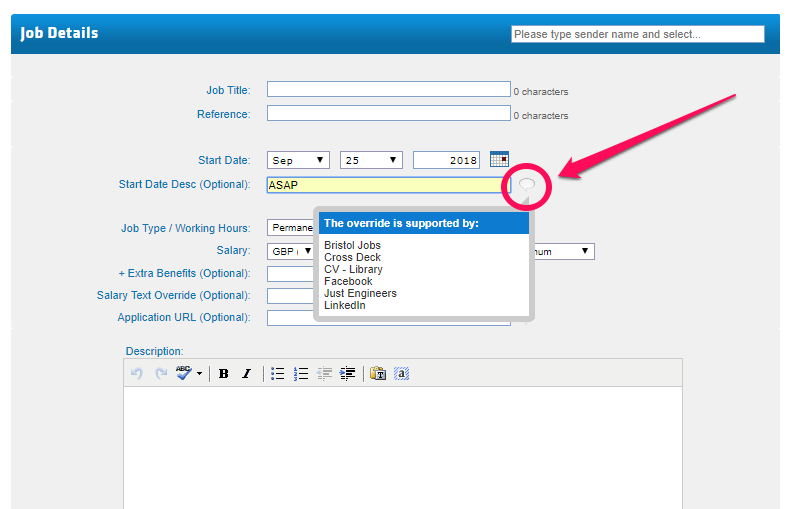 Some job boards however support a 'Start Date Override' as a free-text field (see screengrab below). Whatever is added here will display on the advert in place of the Start Date. The most common uses are adding descriptions such as 'ASAP', 'Immediate start', 'Seasonal' etc..
To see which of the boards you've chosen to post to support this override, simply hover over the 'speech bubble' icon to the right hand side of the field. If the field is populated, then all boards listed within the pop-up will use your free-text override. Any not listed will default to the start-date set above. If you believe a job board should be listed in the pop-up (and it's not) then just let us know. It's always possible that this functionality was introduced after the integration with idibu was originally completed.